Hi All. Apologies for not being more consistent this week with my daily blog. This time of year is full of challenges and finding the time has been difficult with many hoops and hurdles to navigate. I lost internet access on Tuesday which made that day a little more challenging as well. 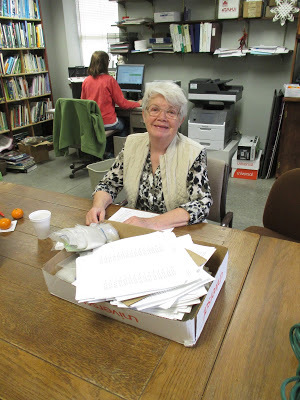 Regardless, despite some rainy/snowy weather these last two days, we’ve had excellent volunteer help from Kay (above), Gena, Myrt, Patty, Nancy, Kathy, Eva, Dr. Gredler, Gary, Alan, Lloyd, Peg, Dave, Vern, Ron P., Gene, Bob C., Maury, Gary, Terri, Sandy and many others. Having most of our grounds staff in action this week (John, Terry, Cindy, Janice, Larry H. and Bob K.) has been nice as well. Lots of painting has occurred as seen in these photos although we’re not neglecting the gardens as flowers continue to slowly emerge even on these colder days. Alan on the left and Gary on the right with our big chairs…or are these guys just really small?